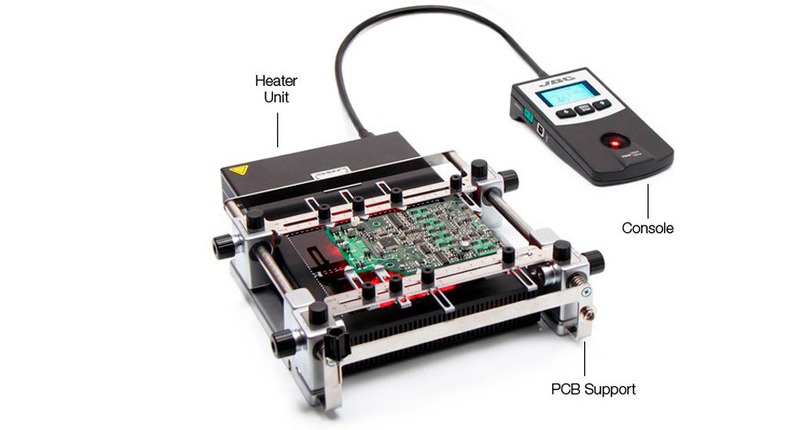 Complete system for preheating multilayer PCBs and ideal for repetitive soldering jobs. It comes with a close loop thermocouple controlled Infrared Preheater Unit and with a PCB Support. The Infrared Preheater PHS is used as a secondary heat source to reduce the amount of energy supplied by the main soldering tool, reducing thermal shock to components and PCBs. The PCB Support PHS-S is perfectly adapted to any type of PCBs by means of its many adjustable parts and its 3 adjustable height positions.